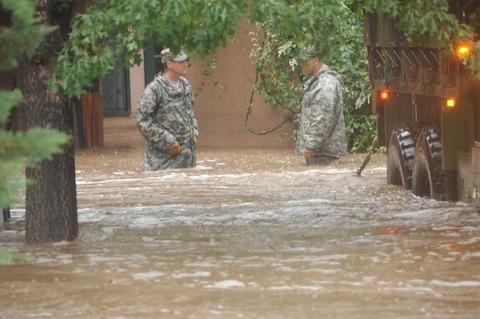 Colorado National Guardsmen respond to floods in Boulder County. Photo by Sgt. Joseph K. VonNida via the Army National Guard. Boulder’s 25 square miles were awash in an estimated 4.5 billion gallons of water as of Friday morning. During flash floods, 2 feet of water can move with enough force to wash away a car. Just 6 inches of water can knock a Denver Bronco-sized adult off his or her feet. An acre-foot of water–the amount of water covering 1 acre with a foot of water–equals 326,000 gallons. The equivalent of 13,803 acre-feet of water fell in the Boulder area.